Standard has been fun lately, with good mana making multicolor decks of all kinds viable as well as mono colored decks being very strong. The power level is high and it doesn’t feel solved. 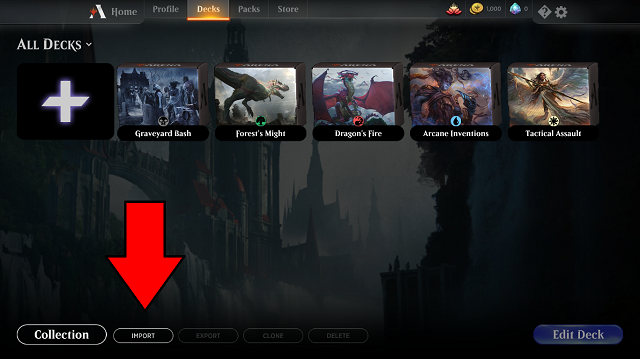 With MTG Arena introducing a dichotomy with best of 1 and best of 3 giving birth to entirely different metagames and even banlists there are obviously still decks rising to the top of the metagame, but I’m not here to give you the newest sideboard guide for the last iteration of Esper Control or the like. I’m here to show you the more unexplored side of the format. With the format as spread out as it is right now most decks try to either be very linear and force their own game threw, i.e. Mono Red, or pack single, powerful cards and generic answers, i.e. Esper or Sultai. 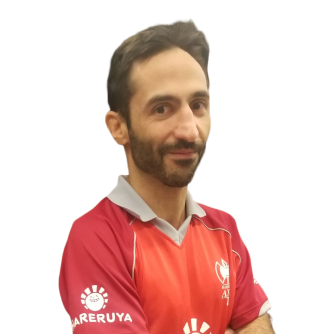 So what you are looking for in your deck is a high density of cheap removal and a gameplan that dodges most of the generic answers while going over the top in powerlevel to the single powerful cards of the slower strategies. One of the strategies that does a good job of going over the top of the midrange and control decks is 《Wilderness Reclamation》, especially the Temur (Blue-Red-Green) variant, since that even has a good sideboard. It is very weak to the aggro decks though, because you simply cannot fit enough cheap removal to stay alive since your goldfish-speed is too slow. Killing someone with 《Expansion/Explosion》 is a good lategame plan, but it doesn’t exactly race a deck attacking you with 1-drops. This is my answer for the format as it stands. And I believe it to be a good choice in both best of 1 and best of 3. 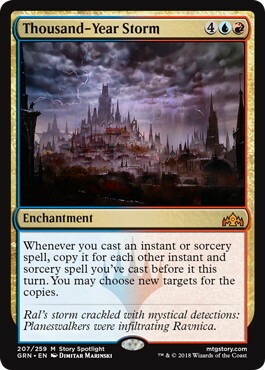 The basic premise of the deck is, of course, to land a 《Thousand-Year Storm》 and then start chaining enough spells to make your small burnspells lethal. Turn 1: 《Stomping Ground》, pass. 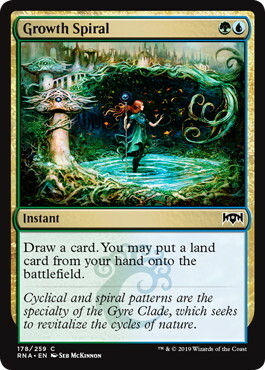 Turn 2: 《Hinterland Harbor》, 《Growth Spiral》, put in 《Sulfur Falls》 《Shock》 their 1-drop. Turn 3: Play 《Island》, 《Pirate’s Pillage》. 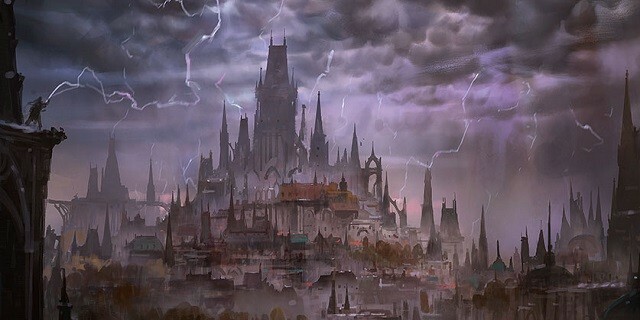 Turn 4: Play 《Sulfur Falls》, 《Thousand-Year Storm》. Turn 5: In play: 5 Lands, 1 Treasure Token, 《Thousand-Year Storm》. Play 《Radical Idea》, 4 mana left, 1 spell. Play 《Opt》, 3 mana left, 2 spells, land, 4 mana 《Pirate’s Pillage》. 0 mana 3 spells. Let the first 2 copies resolve, draw 4 cards, then use 2 of the new Treasure Tokens to cast 《Expansion》 on the original, 4 spells draw 10 more cards and you now have 12 Treasure Tokens in play. 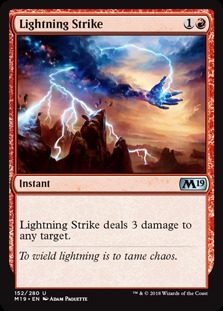 At this point you can probably draw and cast your entire deck, but a 《Lightning Strike》 also does 15 damage so it doesn’t take much. First, you can play a lot of interaction (7 cheap removal spells and 4 《Expansion》 which work to “counter” opposite counterspells) even though you are at heart a linear combo deck, because those cards are actually good in your combo as well, so they play double duty. Next the ramp you play doesn’t cost you a card, instead digging you deeper to find your payoff cards and they are the fuel in your combo at the same time. 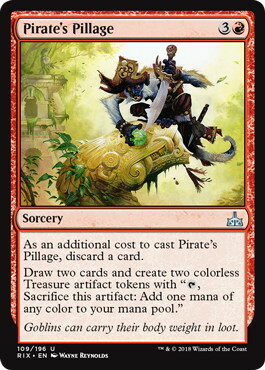 Both 《Growth Spiral》 and 《Pirate’s Pillage》 add additional mana during your combo turn. Which is huge in letting you keep going. 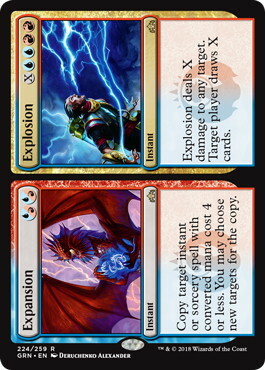 《Expansion/Explosion》 is especially great, since it is one of the best cards during your combo turn (doubling up on anything that you are short on, be that mana, cards or damage) but it can also let you win counterfights as mentioned, or even just let you play a controlstyle game until you find your combo by killing something and drawing you a couple of cards. The biggest factor though is, that it also gives you a legitimate plan B in conjunction with 《Wilderness Reclamation》. The engine of the Reclamation decks (《Wilderness Reclamation》, 《Search for Azcanta》 and 《Expansion/Explosion》) is fully present in the deck, while also pulling double duty for your plan A. 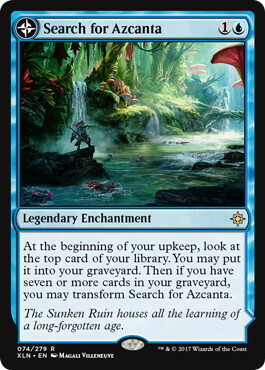 《Search for Azcanta》 is another card that lets you ramp out 《TYS》 a turn early and Reclamation lets you win the turn you play 《TYS》. 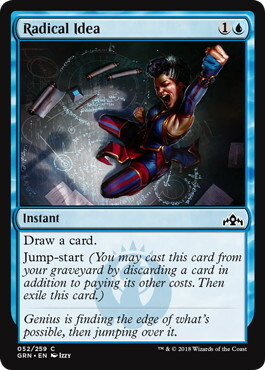 So you basically get to play a controlling game depending on your draw and the opponents deck while still having a very linear combo deck with no cards you are unhappy to draw for the combo itself. 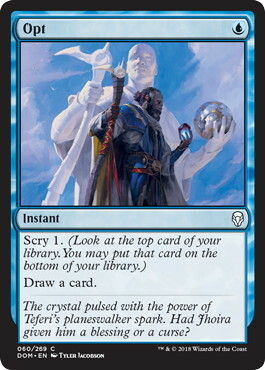 《Opt》 and 《Radical Idea》 are selfexplanatory I think, with 《Opt》 being the best cantrip by far and 《Radical Idea》 being a cheap way to dig early or late while also leaving you with gas for the combo or even providing mulitple spells during the combo out of one card if you draw too many lands. For best of one, it’s pretty straight forward. 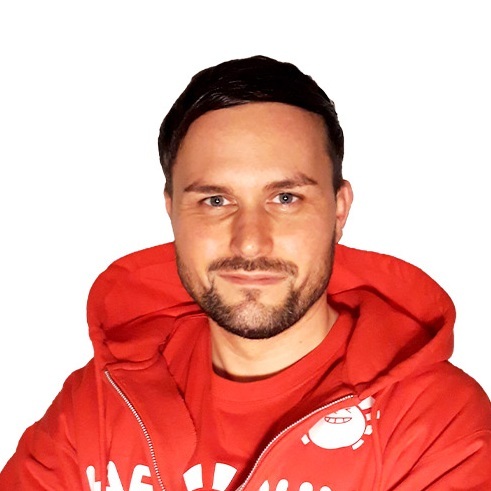 The slower decks, doesn’t really matter which one, tend to not have the tools to beat you since they have so many dead cards and not enough answers to your actual threats. And you have so many threats and so many ways to find them. 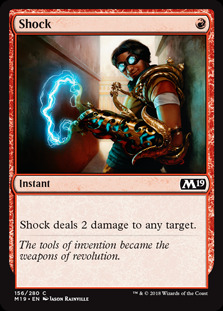 The aggro decks are a straight up race where you can buy some time with your removal, but it is important to not slow down too much, especially when casting your acceleration. Best of three is obviously more complicated. The slower decks bring in more answers and cut their dead cards, but our sideboard is really good in that it can both let us sidestep by bringing in a creature plan as well as fight back with cheap countermagic. The aggro matchup doesn’t really change as much strategically, you basically bring in good blockers to bye more time, but I’ll go in some more depth for each popular matchup since I keep getting asked about sideboarding, and I admit that it is tough with combo decks in general. Take these in-out guides with a grain of salt, as I tend to sideboard very dynamically depending on cards I see, playstyle and cards they saw. 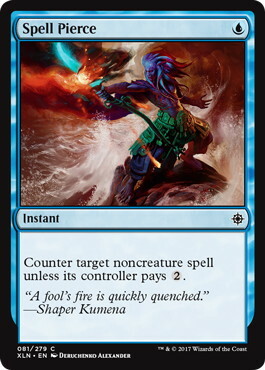 In the maindeck they tend to have around 3 《Mortify》, 4 《Thought Erasure》 and around 5 counterspells, while the rest of their cards are pretty much irrelevant. You have a lot of threats for them to deal with and you can usually just overpower them pretty easily in game one. They don’t really change after board, since they can’t interact and they are already as fast as they can usually which is all that matters from their side. 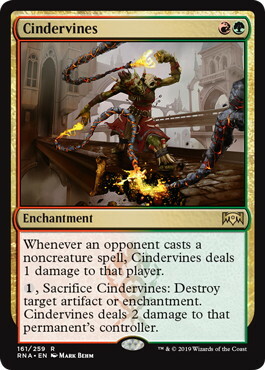 Sometimes they splash green for 《Cindervines》 which we hedge against anyway with our sideboard plan. 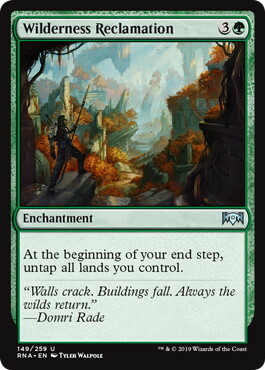 We don’t need the alternate path of 《Wilderness Reclamation》 here, so we replace those with defensive creatures and cheap ways to trade for their burn since they need critical mass more than us. Remember to use 《Expansion》 on their burn spell to kill their creatures if you don’t draw enough removal. They need critical mass of creatures to put on a lot of pressure, so kill everything on sight early and develop your own game as a second priority. 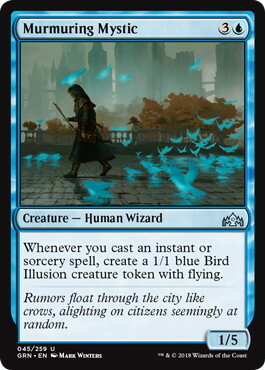 This way you make their Convoke and Anthem cards worse. 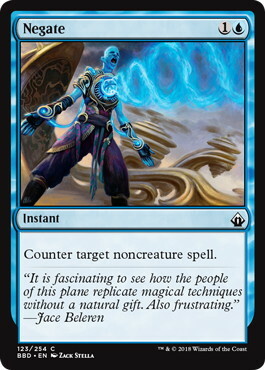 They have removal for your enchantments, so it’s usually better to play more of a controlgame and either with Reclamation. Depending on your draw you sometimes have to just run out the 《TYS》 and hope they don’t have 《one of their 4 answers》 in hand. 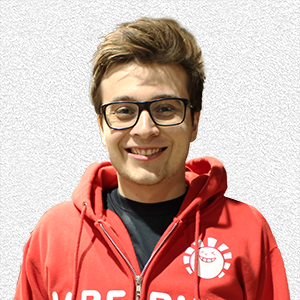 Postboard doesn’t really improve their deck and we get a huge amount better with blockers they have a very hard time attacking through, as well as answers to their enchantment based removal. We shave a little of our combo here since we really just want to control the board and drawing multiples can be rough. They only have very limited interaction, especially in game one. Outside of a few possible copies of 《Assassin’s Trophy》 their main way to interact is through Planeswalkers, either 《Vraska, Relic Seeker》 or 《Vivien Reid》. Their pressure is very limited so you can take your time and play around their sorcery speed enchantment removal. Don’t be afraid to kill their early Explore creatures, you don’t need to save up burn for the combo to work and taking out early creatures will buy you a lot of time later on. You are a huge favorite game one, but postboard they could bring anything especially if they are Sultai. Mostly it will be some number of 《Negate》 and 《Disdainful Stroke》 though. 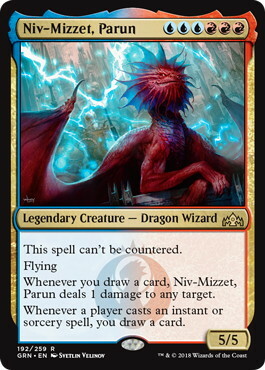 《Niv-Mizzet, Parun》 isn’t great against them, but 《Murmuring Mystic》 can be hard for them to deal with. We don’t board in a lot, since even after board their interaction is very limited and the plan is to just overpower them in the longer games. This includes both Temur Reclamation as well as 《Nexus of Fate》 decks, as they play very similar. The Temur deck has some more interaction, but a slower clock. 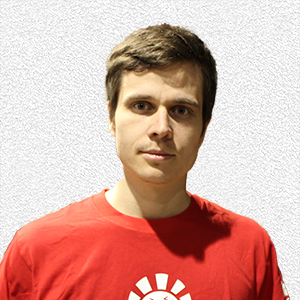 Nexus is more of a straight up race. These types of matchups are very straight forward, whoever assembles their engine/combo faster wins. We have a faster goldfish and more redundancy, since we essentially have a second combo on top of the first so we tend to be favored. Postboard games are very interesting though and both players will be jockeying for position a lot. 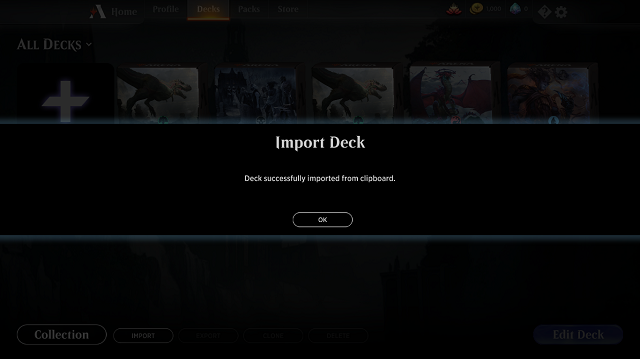 Overall I think this deck is incredibly fun to play and while it’s not going to be the best deck in the format or anything I think it is a solid choice for either grinding Mythic on MTG Arena or taking to whatever tournament you have coming up.